A few weeks ago, I had the pleasure of visiting the Do It 2013 exhibition at Manchester Art Gallery. 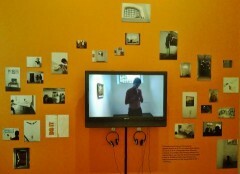 The project is a generative exhibition now in its 20th incarnation, whose concept required exhibiting artists to produce instructions for visiting audiences to carry out, with the intention of “turning the notion of viewing into an active and performative encounter between artist and visitor”. Originally conceived by Hans Obrist Ulrich, Do It 2013 tracks the history of the previous exhibitions alongside new responses to the original instructions. 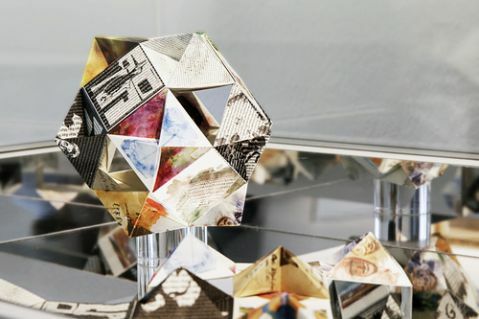 The Manchester exhibition consisted of a number of different elements: A historical timeline of previous iterations of the project, a series of installations to be performed within the gallery, a set of printed instructions to be enacted in the space or taken away, and an online platform. Encountering the historical timeline complete with images and artworks from previous projects throughout the 20 year history of the exhibition, helped to contextualise the project without being overly prescriptive. This reiterative format spanning history and geography to reinterpret and connect artworks, artists and audiences, brought to mind the idea of the allegory echoed throughout time and space. These partial truths which make up the whole, therefore opened up new possibilities of interpretation according to the context in which they were seen, whilst also referencing their earlier incarnation. On the walls of the timeline exhibition were quotes by Hans Ulrich Obrist specifying this aspect of his vision: “Each exhibition is yet another truth. The idea is not to recreate or copy works whose original version is to be found elsewhere but rather to create an open-ended ‘unfolding’ type of exhibition that takes into account local structures and requirements”. Continuing upstairs to the main galleries, there were examples of instructions which had already been carried out alongside printed sheets explaining how to recreate these scenarios for yourself. Even the lift wasn’t exempt, as the usual recording had been usurped by a spoken word sound work which left its passengers feeling somewhat disorientated, as if the elevator had suddenly acquired a personality of its own. Inside the galleries people were already busy experimenting with the sculptures and installations, either contributing to Yoko Ono’s ‘Wish Tree’ or mixing up chilli paste courtesy of Rirkrit Tiravanija’s recipe. 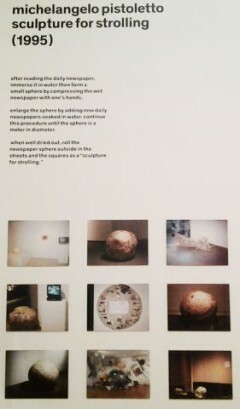 The exhibition continued its generative function by allowing audiences to upload images of themselves carrying out the instructions. These kinds of everyday activities when placed within the context of the white cube gallery space seemed absurd, and perhaps even somewhat embarrassing to engage in. However, the response appeared to be one of delight, with audiences engaging with the objects without necessarily feeling the need to understand what it was about. These relational networks therefore, continue a tradition of artists dealing directly with the materials and ideas of art, whilst avoiding the production of art objects.